Christmas is stressful enough without having to spend hours pulling together spreadsheet after spreadsheet. Plus that is time you could be spending Christmas shopping! One of our clients sends out multiple cards, which differ depending on the type of client. This is easily identified with the use of either tick boxes or a drop-down selection. Separate tick boxes are great if customers can be on multiple Christmas card/send out lists whereas the drop-down lists are better if they can only be on one list. It prevents people from not checking whether they are already on one. In this scenario, we created a single Christmas card drop down with 5 different Christmas options. We then created 5 different dynamic groups to identify the list of clients and addresses that could then be exported to Excel. Another client of ours wanted the cards to be signed from their account managers. This was incredibly simple. By including the account manager on the export to excel, the printers could actually print the account managers name on the cards. 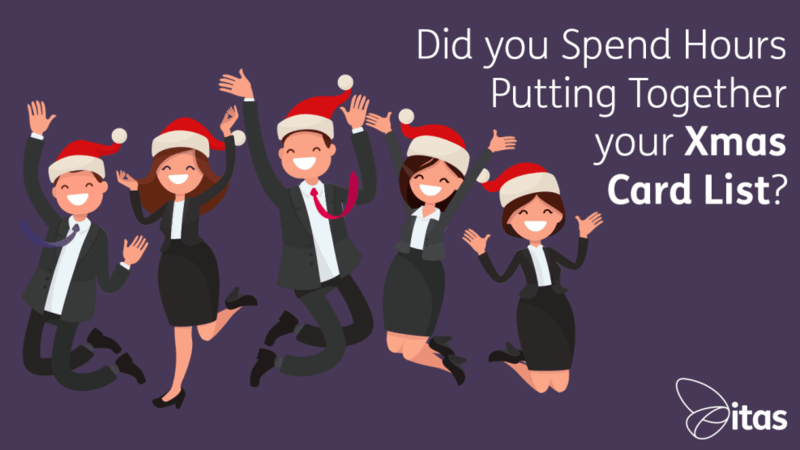 Of course, if you were simply sending them out yourselves then you could create a different group for each account manager and they could mail merge them to a label and sign them personally! What other issues did you have this year collating your Christmas lists? Send us an email to info@itas.org.uk – and we will see if we can help! Wishing you a very happy Christmas and a prosperous new year! Home » Sage Blog » All Sage Blog Posts » Did you spend hours putting together your Christmas card list?